This list is how I price my dolls and is not to be used as fact. It is NOT FACT, it is for my pricing only. also a factor when pricing. Redheads first, then brunettes, then blondes. Plus if they are bobs or pigtail dolls. look like the Chatty Cathy doll, that I know of. because of the way they look and because there just is not enough of them to go around, so everyone wants one. Hard face American Paige Boy dolls with brown eyes can be more rare than a Canadian doll because they are so very hard to find. in good shape without spots so if you can find one she always brings in a very good price. Soft face American blonde bobs with brown eyes. #4. Soft face American pigtail dolls with blue glassine eyes all hair colors. #5. Soft face American pigtail dolls with blue decal eyes all hair colors. dolls and Prototypes soft face blonde blue decal eyed dolls if they talk. #7. Hard face American blonde blue eyed Paige Boy dolls with NO spots. made. But I could be wrong. 2. Canadian redhead pigtail doll with green pinwheel eyes (light or dark green) and with blue pinwheel eyes. 3. Soft face pigtail brunette brown eyes. 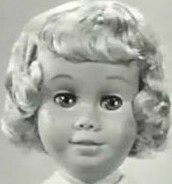 would rank in value at the top of the American doll list if her face was clear of chatty white spots (measles). that!) This is why there is no sure way of telling you her value. Not until she is repaired and talking again anyway. Value of the body after repair. Click here for all about body. 1. number 5 open grill with 4 bottom holes and with white plastic speaker. 2. number 4 open grill missing 4 bottom holes with white plastic speaker can say 11 or 18 phrases, mostly 18. 2. number 1 covered grill with closed voice box and black paper speaker says 11 phrases. (prototype). 3. number 3 open grill with red or black paper speaker says 11 phrases. 4. number 2 open indented grill with closed voice box with white plastic speaker or black paper speaker says 11 phrases. 5. number 1 covered grill with closed voice box and black paper speaker says 11 phrases. Please click here to learn more about the "Foreign Chatty Dolls" Also I have seen this same voice box in Canadian dolls. they will not look right on her because she Never came with those limbs. her please remember that chances are I did have to replace her limbs and a lot of the time I have to replace the body to. have the part I need here, then it keeps her price down. If I have to go out and buy limbs or a body her price will go up. and checked and checked again and checked one last time before she leaves me for her new home. #1 American peachy pink a very pretty color. tan but people like the word yellow best so I used it. does the yellow limbs above match a lot of the soft head pigtail dolls with the more yellow skin. 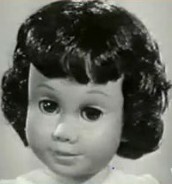 #4 American brown, came on the cloth covered speaker dolls and on the Spanish Speaking doll. #5 American black, only came on the black dolls. Sorry I do not have any pictures of her limbs. did it shrink after it was made? #7 Canadian, peachy pink a color I love. #8 Canadian light brown limbs, not as brown as the American brown limbs but like them just lighter. white limbs black to match her body. But that would be the only reason. NOTE:.. I swear this has to be the hardest page I have even done because there are so many different Chatty Cathy dolls. Email On "Why NO Prices?" amounts, only a list of dolls. Where are the prices??? down, is her body repairable... every thing counts in pricing a doll like her.... because there were so many made. this doll how much is she worth, it doesn't work that way.